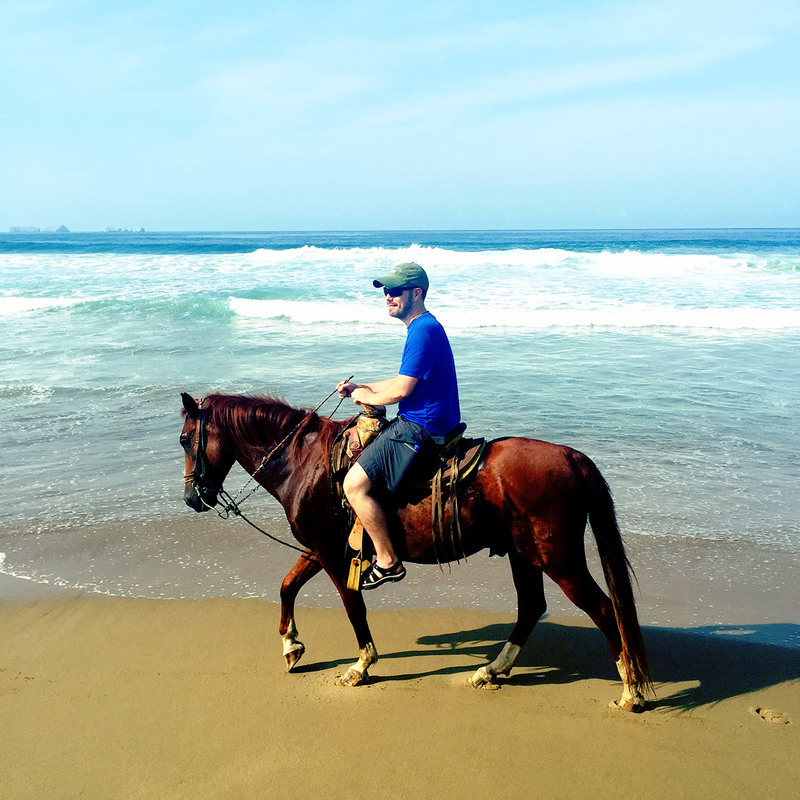 All of which is to stay: when Viator gave me the opportunity to take a horseback riding tour along a quiet, tourist-free beach on the Pacific Coast of Mexico, I said: “Hells. Yes.” Sadly, Mrs. Vagabondish would not be joining me on this trip. And, with only my Spanish-speaking guide, Roberto, for companionship, the romance factor dropped precipitously. Still, the ride was, in a word: amazing. I was picked up at my Ixtapa hotel and whisked fifteen minutes away to a horse ranch near the sleepy, Pacific coast town of Zihuatanejo. Where Ixtapa feels like a canned, factory-produced resort town, the area in and around Zihuatanejo is more “real deal” Mexico. Here, it’s quieter, free of foreign tourists, and a little rough around the edges. As is typical of many Mexico excursions, the ranch eschews any formality (read: training). Ten seconds after meeting my trusty horse, Cameron, I’m already in the saddle and ready to ride. Fortunately, I’ve ridden horses since I was a child so this is nothing new. Ten-year-old Cameron is friendly enough, although he seems a little weary of the entire experience. Clearly, the aforementioned Champagne, sunsets, and fluttering hearts are getting to be “old hat” for him. Another minute later and Roberto and I are underway. We depart the driveway of the ranch and make our way down a rough dirt road, past the remains of a few crumbling buildings in a residential area. Ten minutes later, our path opens suddenly onto Playa Larga — a pristine stretch of sand, free of tourists, beach chairs, and even a single footprint. This is no Ixtapa. Roberto is a man of few words, which is fine because Cameron seems to know exactly where he’s going. With nary a signal from me, he lines up just below the tidal line, where the crashing water is only deep enough to cover the tops of his hooves. And steadfastly puts one hoof in front of the other. He tackles the wet sand effortlessly, as though he’s done this a thousand times before. Roberto and I ride for roughly a mile in silence. At first, it’s eerie. But, after twenty minutes of listening to nothing but the slow, predictable crash of the ocean, wave-after-wave, it becomes meditative. Zen. Roberto points out two small, boutique hotels along the shore. Both look clean but abandoned. He tells me this beach is Playa Larga. We both quietly nod and continue on, mostly in silence. At the end of the beach, we break off into the woods amid acres of coconut trees. Land crabs and iguanas scurry about our feet. This is the way the area in and around Ixtapa used to be some thirty-five years ago before the government decided it was better suited as an all-inclusive resort town. It feels a little like stepping back in time to a purer, untouched Mexico. I only wish Roberto and I could’ve communicated so I could have put more of what we saw in perspective. After roughly fifteen minutes in the woods, Cameron stops and performs an about-face mid-trail with no signalling from me. Roberto explains that this is the turn-around point of our ride. In short time, we make our way back to the beach to do the same trek in reverse. By now, several locals have gathered on the sand now to fish and play in the water. We ride on by, exchanging smiles and an Hola! Back at the ranch, I de-saddle (is that a thing?) and take a minute to whisper a few encouraging words to Cameron. I think the old boy could use them. (I think we made a connection. Fingers crossed, he calls me …) Roberto flashes a subtle smile and we part ways. This entire tour through Viator — from hotel pickup to drop-off — can take up to three hours, but riders are guaranteed around one hour of actual time on horseback. Because of the language barrier, the experience was more of a scenic, straightforward ride than a narrated tour. But, given the sub-$100 price tag, I’d say it’s well worth it, especially if you can take your significant other along with you!